Rollicking good mediaeval multiplayer swordplay with a slightly disappointing single-player game tacked on. Swordplay has long been a staple of videogames, but primarily on the PC: it's much easier to emulate fencing-type skills with a keyboard and mouse than a typical console gamepad. However, For Honor – a bold new mediaeval-style IP from Ubisoft that pitches Knights, Vikings and Samurai against each other in an eternal battle-royal – has a mission to rectify that situation, with a control system designed specifically for console gamepads. And it has succeeded so impressively that we will surely see copycat efforts in the future. For Honor even starts with an apocalypse of sorts: the mediaeval world in which it is set is devastated by a natural disaster, and remains of the three great civilisations – Knights, Vikings and Samurai – regroup, initially with one representative from each skirmishing over a rare water-source, before they engage on centuries of war. 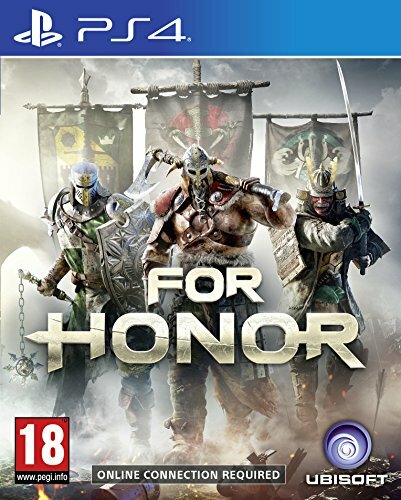 This allows For Honor to purvey a three-part single-player game: in the first campaign, you play as various Knights, then Vikings and finally Samurai. The Knights campaign builds from tutorial-style beginnings, pitching you into some agreeably diverse situations like sieges and introducing the control system in all its considerable depth. Plus there are boss-battles and short gameplay-varying sequences in which, for example, you man fixed projectile-shooters. Across the three campaigns, the difficulty level ramps up smoothly, so that by the end of the Samurai campaign, you routinely encounter foot-soldiers who are as difficult to dispatch as bosses were in the earlier stages, and the bosses themselves require some major tactical head-scratching. A level-up system – which is augmented by power-ups you find on the battlefield – brings perks, two of which can be equipped at a time. The ability to heal yourself, for example, has a pretty glacial cool-down period so that, along with the presence of collectables, there's the incentive to crank up the difficulty level and have more passes at the single-player campaign. However, that campaign doesn't entirely convince. It's pretty short, and while developer Ubisoft Montreal strives manfully to give it an epic, 300-style storyline, its narrative arc utterly fails to engage. But that doesn't really matter, since there's plenty of thick-of-the-battle action to keep you engrossed: atmospherically, For Honor is superb – you can almost smell the sweat of your opponents. The control system and general structure of the gameplay, however, is exemplary. Once you focus on a particular opponent with the left-trigger, you default to blocking mode, and can pick three directions – left, right and up – with the right stick. The right trigger and bumper launch heavy and light attacks. You must block and attack in the correct direction – an arrow shows your opponent's attack/block direction, so it works like a sophisticated rock/paper/scissors. And if you time an attack correctly, it becomes a parry, staggering your opponent. The ability to launch attacks in which you rush at enemies and push them over (or into spiked traps or off cliffs) adds more depth (although it can be an annoyance in some multiplayer maps), and the various heroes you play as have wildly differing levels of mobility and attacking or defensive effectiveness. Sequences in which you're swamped by basic troops – who can be dispatched with a single swipe or, preferably, a chain of attacks triggering special moves – prove pretty satisfying, while at times you'll find yourself beset by more than one proper enemy, which again brings extra tactical considerations. For Honor really comes into its own when you dive into its multiplayer. Ubisoft clearly wants that element of the game to develop into a full-blown e-sport, and it has a chance of achieving that aim. First, you must pick your faction – you can change later, but you get penalised in certain ways if you do so. The whole multiplayer world has an overarching, board game-style state of play, which monitors the progress of each faction against the other; as you progress in the game's multiplayer, you earn war resources which can be deployed to help your faction in an attacking or defensive manner. That gives you a sense of participating in a rumbling, ongoing war, in which the participants are real humans, rather than AI bots (although you can opt to play most multiplayer modes against the AI, rather than humans – we're not entirely sure why). Some of the modes reinforce that impression, most notably Dominion, a four-versus-four mode, bulked out with AI bots, in which two teams battle to dominate three designated zones. It's fairly familiar stuff, but works well in the context of a mediaeval sword-fighting game, and rewards teams that take a co-ordinated tactical approach, but is also fun to play with a team of randoms. Skirmish is 4v4 Team Deathmatch, and when one team reaches a certain number of points, the spirit of the other team is deemed to be "broken", so its members will no longer respawn; the winning team must kill them all in order to win the round. Elimination is similar, except no respawns are allowed, so tactics come very much to the fore – it's much easier to take out good players if you gang up with someone else to take them on. Perhaps the most interesting multiplayer modes are Duel and Brawl. The former is pretty self-explanatory: you take on one other player, in a best of five rounds format – obviously with no respawns. Brawls are exactly the same, except with two teams of two players. Both modes test your true skill at playing the game – luckily, the opponent matching seems to be pretty good. As you progress in the multiplayer, you can unlock (or buy, using the in-game cash) new Heroes with different attributes, and there's plenty of loot, including upgrades for things like the hilt of your sword, to be had. For Honor is great fun and deeply satisfying to play - far more so than we thought when originally seeing the game at E3 2015. You can pick holes in the single-player campaign though. It's full of ideas which briefly crop up and are then abandoned (such as poison-traps) – but in the end, that single-player campaign merely constitutes window-dressing for the excellent control system and the multiplayer. While multiplayer doesn't possess any radical new modes which feel unlike anything that has gone before, it stills feels distinctive, and the sense of participating for the good of your tribe makes For Honor even more compelling. As long as you bear in mind that, at its core, For Honor is a multiplayer game, you should find it deeply enjoyable. For Honor is available now for PC (£39.98), PS4 (£42 / $59.15) and Xbox One (£42 / $59.15).